Exercise promotes learning and memory formation. These effects depend on increases in hippocampal BDNF, a growth factor associated with cognitive improvement and the alleviation of depression symptoms. Identifying molecules that are produced during exercise and that mediate hippocampal Bdnf expression will allow us to harness the therapeutic potential of exercise. Here, we report that an endogenous molecule produced during exercise in male mice induces the Mus musculus Bdnf gene and promotes learning and memory formation. The metabolite lactate, which is released during exercise by the muscles, crosses the blood–brain barrier and induces Bdnf expression and TRKB signaling in the hippocampus. Indeed, we find that lactate-dependent increases in BDNF are associated with improved spatial learning and memory retention. The action of lactate is dependent on the activation of the Sirtuin1 deacetylase. SIRT1 increases the levels of the transcriptional coactivator PGC1a and the secreted molecule FNDC5, known to mediate Bdnf expression. These results reveal an endogenous mechanism to explain how physical exercise leads to the induction of BDNF, and identify lactate as a potential endogenous molecule that may have therapeutic value for CNS diseases in which BDNF signaling is disrupted. Exercise attenuates the symptoms of neurodegenerative diseases, such as Alzheimer's and Parkinson's diseases (Adlard et al., 2005b; Nichol et al., 2007; Tajiri et al., 2010; Real et al., 2013) as well as relieves the symptoms of depression (Russo-Neustadt et al., 2000; Duman et al., 2008). Exercise mediates these beneficial responses by inducing neurogenesis (van Praag et al., 1999) and improving learning and memory formation (Vaynman et al., 2004, 2006; Berchtold et al., 2010). The positive changes observed in the brain after exercise are mediated by the induction of BDNF expression in the hippocampus (Neeper et al., 1995; Oliff et al., 1998; Tong et al., 2001; Berchtold et al., 2005) and the activation of its tropomyosin kinase receptor B (TRKB) receptor (Vaynman et al., 2004; Real et al., 2013; Parrini et al., 2017). Indeed, blocking BDNF signaling in the hippocampus attenuates exercise-induced learning and memory formation (Vaynman et al., 2004; García-Mesa et al., 2014; Kim and Leem, 2016). BDNF is highly expressed in the brain where it regulates neuronal survival, growth, and differentiation during development. BDNF also mediates spine formation and neuronal plasticity as well as promotes learning and memory (Mitre et al., 2017). Indeed, alterations in BDNF/TRKB signaling are observed in a variety of CNS disorders (Gupta et al., 2013; Mitre et al., 2017). Considering the important role that BDNF plays in mediating brain health, identifying novel molecules and pathways that induce BDNF is of immediate therapeutic relevance. It has long been established that exercise increases BDNF levels and signaling in the hippocampus to enhance learning and memory formation and ameliorate the symptoms of diseases (Cotman et al., 2007; Wrann et al., 2013; Sleiman et al., 2016); however, the molecular pathways responsible for the exercise-mediated BDNF induction have been elusive. There has been some recent progress in elucidating these pathways. We have shown that a ketone body, β-hydroxybutyrate (DBHB) produced in the liver during exercise, is released into the blood where it accumulates in the hippocampus and induces Bdnf expression by acting as a direct Class I histone deacetylase (HDAC) inhibitor. 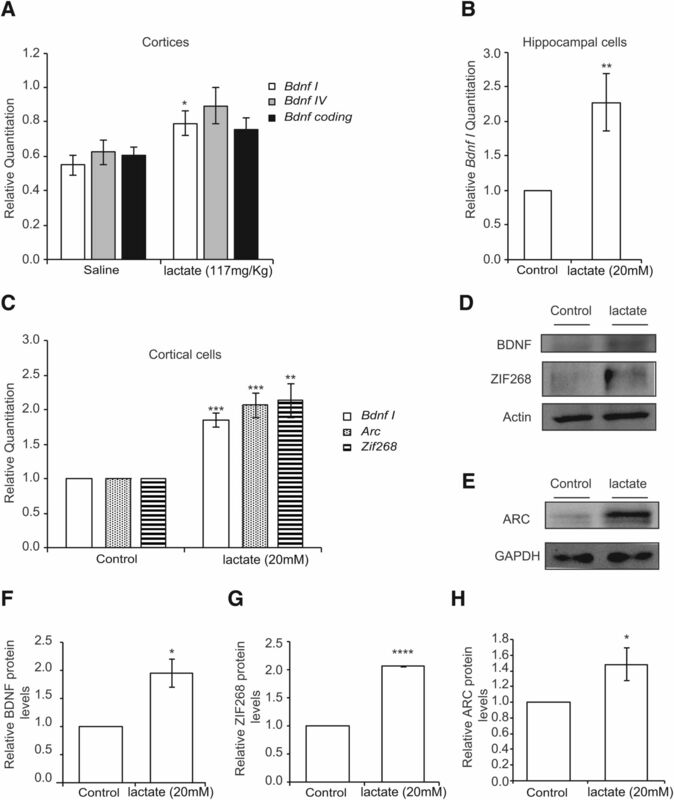 By inhibiting HDAC2 and HDAC3 and preventing their recruitment to the Bdnf promoter I, DBHB induces Bdnf expression and mediates synaptic plasticity (Sleiman et al., 2016). Another mechanism by which exercise induces hippocampal Bdnf expression results from the induction of the transcriptional coactivator PGC1a and the estrogen-related receptor ERRa. This transcriptional activating complex induces the expression of the myokine gene Fndc5. FNDC5 activates hippocampal Bdnf expression (Wrann et al., 2013). It is not yet known how FNDC5, a protein that is cleaved and secreted, is capable of activating hippocampal Bdnf gene expression to promote learning and memory formation. In this work, we endeavored to identify novel exercise-produced molecules that could induce hippocampal Bdnf gene expression. Identifying such endogenous “exercise factors” transmitted from peripheral organs through the blood to the CNS where they can mediate brain health may be crucial for harnessing the full therapeutic potential of exercise. One molecule that is released after exercise by the muscle is lactate. Lactate is released into the blood and taken up by the liver, where it is converted back to pyruvate, and later to glucose or glycogen depending on cellular needs. Lactate also crosses the blood–brain barrier (BBB) via endothelial monocarboxylate transporters (MCTs) (Pierre and Pellerin, 2005; E et al., 2013) and serves as an energy source for the brain (Quistorff et al., 2008) and as a neuroprotective factor (Berthet et al., 2009; Bezzi and Volterra, 2011; Newman et al., 2011; Suzuki et al., 2011). Because of these effects, we hypothesized that lactate is an exercise factor that induces hippocampal Bdnf expression and mediates exercise's effects on learning and memory. In this work, we show that voluntary exercise induces lactate accumulation in the hippocampus, where it promotes learning and memory formation by inducing Bdnf expression through silent information regulator 1 (SIRT1)-dependent induction of the PGC1a/FNDC5 pathway. Adult male C57BL/6 mice were housed in cages and divided according to the experimental groups: saline or lactate receiving. The mice were provided with food and water ad libitum and maintained on a 12 h light/dark cycle. Male mice were intraperitoneally injected with different lactate concentrations (117 or 180 mg/kg) alone or in combination with the TRK inhibitor CEP701 (3 mg/kg) or with saline. Mice were killed 1 or 4 h after injection time; the brains were dissected on dry ice, and the hippocampi were collected and stored at −80°C for later analysis. Animal care and use were in accordance with the guidelines set by the National Institutes of Health and the Lebanese Ministry of Health and as approved by the Animal Care and Use Committee. Male mice were individually housed with food and water ad libitum and maintained on a 12 h light/dark cycle. They were divided into two groups: sedentary animals or exercising animals. The exercising animals were housed with free access to a running wheel. Animals were killed after 30 d, and hippocampi were collected and immediately frozen on dry ice. Animal care and use were in accordance with the guidelines set by the National Institutes of Health and the Lebanese Ministry of Health. In the experiments that tested the effect of lactate transporter inhibition on exercise-induced hippocampal Bdnf expression, animals received intraperitoneal injections of ARC-155858 (50 nm/mouse) once daily on exercise days 26–28, and twice daily within 5 h time interval on days 29 and 30. Animals were killed after 30 d, and hippocampi were collected and immediately frozen on dry ice. In the experiments that tested the effect of lactate transporter inhibition on exercise-induced spatial learning, animals received intraperitoneal injections of ARC-155858 (50 nm/mouse) once daily on exercise days 26–30, and twice daily for the duration of the water maze test: Morris Water Maze (MWM). Immature primary cortical, hippocampal, and mixed (cortical/hippocampal) neurons were obtained from C57BL/6 mice (embryonic day 17 [E17]) as previously described (Ratan et al., 1994a,b). Mature cortical neurons were maintained in Neurobasal media (Invitrogen) supplemented with B27, and Glutamax (Invitrogen). Primary neurons were isolated as described above, and 1 million cells were plated in six well plates. On day 6, cells were treated with different concentrations of lactate (Sigma-Aldrich) for 1 or 4 h. Lactate was prepared as 0.62 m stock in PBS and used at a final concentration of 20 mm. Sirtinol (Sigma-Aldrich) was prepared as 10 mm stock in DMSO and used at a final concentration of 50 μm. Total RNA was prepared from primary cortical neurons or hippocampi using the Rneasy Plus Mini RNA extraction kit (QIAGEN) or NucleoSpin RNA II Kit (Clontech) according to the manufacturer's protocol. Reverse transcription was performed using iScript cDNA Reverse transcription kit (Bio-rad) according to the manufacturer's protocol. Real-time PCRs were performed using standard PCR protocol, with SYBR Green dye (Bio-Rad). Details of the primers used are as follows: primer sequence (5′-3′): Bdnf pI: forward, 5′-CAGGACAGCAAAGCCACAAT; reverse, 5′-GCCTTCATGCAACCGAAGTA; Sirt 1: forward, AAAGGAATTGGTTCATTTATCAGAG; reverse, TTGTGGTTTTTCTTCCACACA; forward, 5′-CTCTCTGCTCCTCCCTGTTC; reverse, 5′-CCGACCTTCACCATTTTGTC; Pgc1a: forward, TGATGTGAATGACTTGGATACAGACA; reverse, GCTCATTGTTGTACTGGTTGGATATG; Fndc5: forward, ATGAAGGAGATGGGGAGGAA; reverse, GCGGCAGAAGAGAGCTATAACA; Arc: forward, 5′-TACCGTTAGCCCCTATGCCATC; reverse, 5′-TGATATTGCTGAGCCTCAACTG; Zif268: forward, 5′-TATGAGCACCTGACCACAGAGTCC; reverse, 5′-CGAGTCGTTTGGCTGGGATAAC. Total cell proteins were prepared by lysing cells in RIPA-B (1% Triton X-100, 1% SDS, 50 mm Tris-Cl, pH 7.4, 500 mm NaCl, and 1 mm EDTA) in the presence of protease inhibitors (Sigma-Aldrich), the proteasome inhibitor MG-132 (Sigma-Aldrich), and phosphatase inhibitors (Sigma-Aldrich) followed by benzonase nuclease (Sigma-Aldrich) digestion for 15 min. Nuclear proteins were prepared by homogenizing and lysing hippocampi first in buffer A (10 mm HEPES, pH 7.9, 10 mm KCl, 1.5 mm MgCl2, 0.34 m sucrose, 10% glycerol, 0.1% Triton X-100, 1 mm DTT, protease inhibitors, PMSF, MG132, and sodium orthovanadate). Next, nuclear proteins were extracted in buffer B (3 mm EDTA, 0.2 mm EGTA, 0.3 m NaCl, 1 mm DTT, protease inhibitors, MG132, and phosphatase inhibitors). Hippocampal lactate levels were measured using the l-lactate assay kit (Abcam) according to the manufacturer's protocol. Hippocampal Sirt1 activity was measured from nuclear lysates using the Universal SIRT Activity Assay Kit (Abcam) according to the manufacturer's protocol. Samples were boiled in Laemmli buffer and electrophoresed on Bis-Tris 30% acrylamide gels (Bio-Rad). Proteins were transferred to a PVDF membrane (Bio-Rad) using semidry TransBlot Turbo Transfer System (Bio-Rad). Nonspecific binding was inhibited by incubation in blocking buffer (BSA and TBS-Tween 20). Antibodies against Trkb (gift from Moses V. Chao), phospho-Trkb (gift from Moses V. Chao), BDNF (Santa Cruz Biotechnology), ARC (Abcam), ZIF268 (Abcam), PGC1a (Abcam), FNDC5 (Abcam), and β-actin (Sigma-Aldrich) were diluted 1:1000, 1:1500, 1:1000, 1:1000, and 1:5000, respectively, in blocking buffer, and the membranes were incubated overnight at 4°C. Secondary antibodies (Bio-Rad) were used at a 1:5000 dilution followed by incubation for 90 min at room temperature. Finally, proteins were detected by chemiluminescence on ChemiDoc (Bio-Rad) using Clarity Western ECL Substrate (Bio-Rad) or by SuperSignal West Femto Maximum Sensitivity Substrate (Pierce) for PGC1A and BDNF. Five Sirt1(NM_019812) shRNA clones (Sigma-Aldrich) were used to knock down the expression of Sirt1 in mixed primary neuronal cultures as follows: TRCN0000327027 (CCGGGAGGGTAATCAATACCTGTTTCTCGAGAAACAGGTATTGATTACCCTCTTTTTG), TRCN0000327028 (CCGGCCTGAAAGAACTGTACCACAACTCGAGTTGTGGTACAGTTCTTTCAGGTTTTTG), TRCN0000306518 (CCGGCTAGACCAAAGAATGGTATTTCTCGAGAAATACCATTCTTTGGTCTAGTTTTTG), TRCN0000306512 (CCGGAGTGAGACCAGTAGCACTAATCTCGAGATTAGTGCTACTGGTCTCACTTTTTTG), and TRCN0000326966 (CCGGGCCATGTTTGATATTGAGTATCTCGAGATACTCAATATCAAACATGGCTTTTTG). The Sirt1 shRNA clones and a Non-Target shRNA Control Vector (Sigma-Aldrich) were introduced into immature primary mixed neurons (E17) using the Amaxa mouse Neuron Nucleofector kit as directed by the manufacturer (Lonza Walkersville). On day 6, SIRT1 knockdown was confirmed by real-time RT-PCR. C57BL/6 male mice (6 weeks) received intraperitoneal injections of saline or lactate and tested in an MWM after 4 h. All water maze data were recorded using ANY-maze Video Tracking System. The MWM was used as previously described (Morris, 1984). Briefly, mice used visual cues placed on the borders of a swimming pool to reach a hidden platform and escape from the water. Learning was assessed across 5 d. Before learning assessment, mice were introduced into the pool that contains clear water and a visible platform. This training allowed the mice to become familiar with the task. During the learning phase, white paint was added to the water and the platform was submerged. Each mouse was subjected to three trials from different starting points. Latency or the time required to reach the platform was recorded every day by the ANY-maze Video Tracking System. On the last day of the experiment, the platform was removed and each mouse was reintroduced into the water and the time spent in the quadrant that previously contained the platform (target quadrant) was recorded. n = 35, 31, and 34 for control, lactate 117 mg/kg, and 180 mg/kg, respectively. Unpaired t test, one-way or two-way ANOVA followed by the Dunnett or Bonferroni post-tests, respectively, were used to measure statistical significance. p < 0.05 was considered to be statistically significant. All graphs are presented as mean ± SEM. To assess whether exercise induces increases in hippocampal lactate concentrations, we subjected mice to a 30-d-long voluntary exercise protocol (Fig. 1A) (Wrann et al., 2013; Sleiman et al., 2016). Exercising mice in this paradigm have significantly higher hippocampal Bdnf expression levels (p = 0.001 for exercise vs control, one-way ANOVA) as measured by real-time RT-PCR (Fig. 1C) as well as BDNF signaling (Wrann et al., 2013; Sleiman et al., 2016). Interestingly, mice subjected to voluntary exercise showed a modest, yet significant, increase in hippocampal lactate levels compared with control mice (p = 0.0366 and df = 17, unpaired t test) (Fig. 1B). These data are consistent with previously reported increases in brain and hippocampal lactate levels after different exercise paradigms (Ide et al., 1999, 2000; Ferreira et al., 2007; Dienel, 2012). 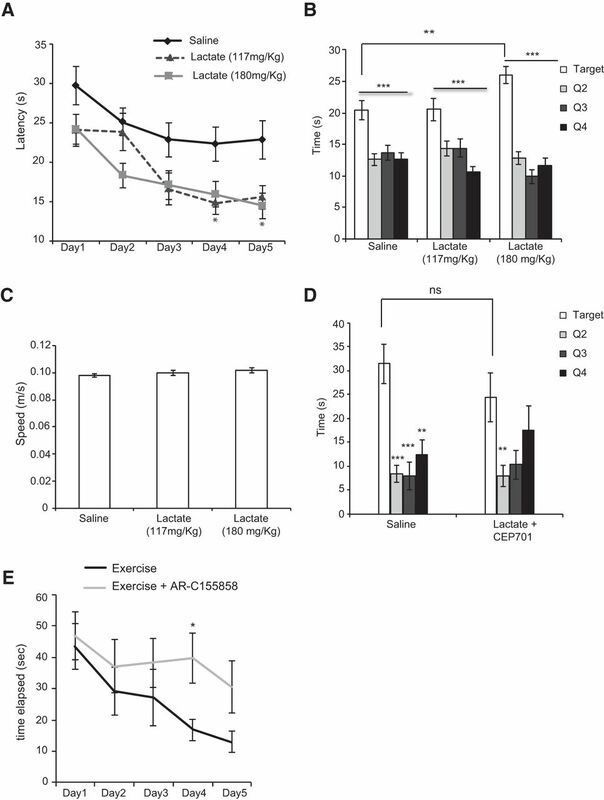 To assess whether voluntary exercise induces hippocampal Bdnf expression by increasing lactate levels, exercising mice received intraperitoneal injections of the lactate MCT1/2 inhibitor, AR-C155858 (Ovens et al., 2010). The Bdnf gene has multiple promoters that generate many transcripts through alternative splicing with a common coding exon (Pruunsild et al., 2011). We focused on the Bdnf gene promoter I (pI) because it is a neuronal activity-dependent (Tabuchi et al., 2002) and exercise-dependent promoter (Tong et al., 2001; Sleiman et al., 2016). As expected, exercising mice have significantly higher hippocampal Bdnf promoter I (Fig. 1C), but not promoter IV or coding (Fig. 1D) expression levels compared with control as measured by real-time RT-PCR. The increase in promoter I expression was abolished in exercising mice that received the lactate transporter inhibitor, AR-C155858 (p = 0.001 for exercise vs control and p = 0.4778 for exercise+AR-C155858 vs control; one-way ANOVA followed by Dunnett's post-test) (Fig. 1C). These data demonstrate that lactate, which is released in the peripheral organs during voluntary exercise, crosses the BBB and accumulates in the hippocampus where it is important for exercise's effect on Bdnf induction. Lactate mediates in part the voluntary exercise-mediated induction of hippocampal Bdnf expression and promotion of learning. A, The exercise paradigm involves 4 weeks of voluntary exercise followed by animal death and hippocampal isolation. B, Voluntary exercise for 4 weeks significantly increases hippocampal lactate levels. The number of hippocampi used for each group (control and exercise) is 10 and 9, respectively. **p < 0.01 (unpaired t test; p = 0.0366 and df = 17). C, Voluntary exercise significantly induces Bdnf promoter I expression in the hippocampus as measured by real-time RT-PCR, whereas inhibiting the lactate MCT transporters by AR-C155858 (50 nm/mouse) abolishes this induction. The number of hippocampi used for each group (control, exercise, and exercise + AR-C155858) is 5, 2, and 4, respectively. **p < 0.01 (one-way ANOVA followed by Dunnett's multiple-comparison test; p = 0.001 for exercise vs control and p = 0.4778 for exercise + AR-C155858 vs control). D, Voluntary exercise does not induce Bdnf pIV or coding expression in the hippocampus as measured by real-time RT-PCR. To assess whether lactate, a metabolite that is increased in the blood by exercise (Smith et al., 1997; Ide et al., 1999, 2000; Ferreira et al., 2007; Meek et al., 2009; Dienel, 2012), directly enhances Bdnf gene expression in the hippocampus, we injected mice intraperitoneally with either saline or lactate (117 or 180 mg/kg). Animals were killed 1 h after the injections, and tissues were collected for analysis. The amount of lactate that was injected yields 13 or 20 mm lactate concentrations in the blood. These concentrations are consistent with lactate plasma levels reported after exercise. Indeed, exercise induces an increase in plasma lactate concentrations that can reach up to 30 mm (Dienel, 2012) as well as a concomitant increase in brain and hippocampal lactate concentrations (Ide et al., 1999, 2000; Ferreira et al., 2007; Dienel, 2012). The two concentrations we used yielded modest increases in hippocampal lactate levels (Fig. 2A) (p = 0.003 for lactate 117 mg/kg vs control; one-way ANOVA followed by Dunnett's post-test) very similar to the increases that were observed in the exercising mice (Fig. 1B). To determine the effects of lactate on Bdnf expression in the hippocampus, we performed real-time RT-PCR. Our results showed that, like exercise (Fig. 1C), lactate significantly induced Bdnf promoter I expression in the hippocampus (p = 0.0316 for lactate 117 mg/kg vs control and p = 0.0564 for lactate 180 mg/kg vs control, one-way ANOVA followed by Dunnett's post-test) (Fig. 2B), but not Bdnf promoter IV or coding expression (Fig. 2C). Western blot analysis of hippocampal tissue isolated from animals receiving lactate showed a significant increase in BDNF protein levels (p = 0.0438, and df = 9 as measured by unpaired t test) and TRKB phosphorylation compared with control mice (p = 0.000052 and df = 4 as measured by unpaired t test) (Fig. 2D–F) as well as an increase in the protein levels of the synaptic plasticity genes ARC and ZIF268 (ZIF268 p = 0.0196, df = 9 for lactate 180 mg/kg vs control; ARC p = 0.0303, df = 7 for lactate 180 mg/kg vs control as measured by one-way ANOVA followed by the Dunnett's post-test) (Fig. 2G,H). Together, the data are consistent with systemic delivery of lactate-activating, BDNF-signaling pathways in the hippocampus. Interestingly, inhibiting the MCT1/2 lactate transporters abolished the lactate-mediated induction of hippocampal Bdnf expression, emphasizing the importance of the ability of lactate to cross the BBB (Fig. 2I). Interestingly, the ability of lactate to induce Bdnf promoter I, but not promoter IV or coding expression, was not restricted to the hippocampus but was also observed in the cortex (p = 0.0367, df = 6 as measured by unpaired t test) (Fig. 3A). These results led us to test whether lactate-mediated induction of Bdnf expression is neuron-specific. Peripheral delivery of lactate induces hippocampal Bdnf expression and signaling. A, Intraperitoneal injections of lactate to reach equivalent levels to those reported in the blood after exercise lead to increases in hippocampal lactate. This increase is equivalent to the increase in hippocampal lactate observed after exercise. The number of hippocampi used for each group (control, lactate 117 mg/kg, or lactate 180 mg/kg) is 10, 9, and 7, respectively. **p < 0.01 (one-way ANOVA followed by the Dunnett's post-test; p = 0.003 for lactate 117 mg/kg vs control). B, Intraperitoneal injection of lactate (117 or 180 mg/kg) similar to levels reported during exercise significantly induces hippocampal Bdnf pI expression levels as measured by real-time RT-PCR. The expression was analyzed from the hippocampi of 5 control mice, 5 mice receiving 117 mg/kg lactate, and 5 mice receiving 180 mg/kg lactate. *p < 0.05 (one-way ANOVA followed by the Dunnett's multiple-comparison test; p = 0.0316 for lactate 117 mg/kg vs control and p = 0.0564 for lactate 180 mg/kg vs control). C, Intraperitoneal injection of lactate (117 mg/kg) does not induce hippocampal Bdnf pIV and coding expression levels as measured by real-time RT-PCR. The expression was analyzed from the hippocampi of 4 control mice and 4 mice receiving 117 mg/kg lactate. D, Representative Western blot image depicting the increase in BDNF protein levels and in phosphorylation in the BDNF receptor TRKBB (pTRKB) in the hippocampus of control animals compared with mice receiving 117 mg/kg of lactate. E, Quantification of the BDNF Western blot. *p < 0.05 (unpaired t test; p = 0.043 and df = 4). F, Quantification of the pTRKB Western blot. ****p < 0.0001 (unpaired t test; p = 0.000052 and df = 4). G, Representative Western blot image depicting the increase after 10 min in ZIF268 and ARC protein levels in the hippocampus of control animals compared with mice receiving 117 and 180 mg/kg of lactate. H, Quantification of the ZIF268 and ARC Western blots. *p < 0.05 (one-way ANOVA followed by the Dunnett's multiple-comparison test; ZIF268, p = 0.0196, df = 9 for lactate 180 mg/kg vs control; ARC, p = 0.0303, df = 7 for lactate 180 mg/kg vs control). I, Intraperitoneal injection of lactate (180 mg/kg) along with the lactate MCT transporters AR-C 155858 (50 nm/mouse) did not induce hippocampal Bdnf pI expression levels as measured by real-time RT-PCR. The expression was analyzed from the hippocampi of 5 control mice, 5 mice receiving 180 mg/kg lactate, and AR-C 155858 (50 nm/mouse). Significance was measured by unpaired t test (p = 0.9910 and df = 8). Lactate induces exercise-dependent Bdnf pI and activity-dependent gene expression in mouse primary neurons. A, Intraperitoneal injection of lactate (117 mg/kg) significantly induces cortical Bdnf pI but not pIV or coding expression levels as measured by real-time RT-PCR. The expression was analyzed from the hippocampi of 4 control mice, 4 mice receiving 117 mg/kg lactate. *p < 0.05 (unpaired t test; p = 0.036, df = 6 for lactate 117 mg/kg vs control). B, Lactate significantly induces Bdnf pI expression in primary hippocampal neurons as measured by real-time RT-PCR. **p < 0.01 (unpaired t test; p = 0.0073 and df = 9 for lactate 20 mm vs control). n = 5. Each replicate consisted of primary neurons obtained from different cultures and treated with fresh dilutions of the compounds for 1 h. C, Lactate significantly induces Bdnf pI and activity-dependent gene (Arc and Zif268) expression in primary cortical neurons as measured by real-time RT-PCR. **p < 0.01 (unpaired t test; Bdnf pI, p = 0.0014 and df = 4 for lactate 20 mm vs control; Arc, p = 0.0014 and df = 5 for lactate 20 mm vs control; Zif268, p = 0.0039 and df = 6 for lactate 20 mm vs control). n = 4. Each replicate consisted of primary neurons obtained from different cultures and treated with fresh dilutions of the compounds for 1 h. D, E, Representative Western blot images depicting the lactate-mediated increase in BDNF, ZIF268, and ARC protein levels in mixed (cortical and hippocampal) primary neurons. F, Quantification of the BDNF Western blots. *p < 0.05 (unpaired t test; p = 0.0199, df = 4). G, Quantification of the ZIF268 Western blots. *p < 0.05 (unpaired t test; p < 0.0001, df = 2). H, Quantification of the ARC Western blots. *p < 0.05 (unpaired t test; p = 0.0483, df = 4). ***p < 0.001; ****p < 0.0001. To test whether lactate can induce the expression of Bdnf in neurons, we treated primary neuronal cultures with lactate for 1 h, extracted neuronal RNA, and performed real time RT-PCR. We found that lactate significantly induced Bdnf promoter I expression in primary hippocampal (p = 0.0073 and df = 9 for lactate 20 mm vs control) (Fig. 3A) and cortical neuronal cultures (p = 0.0014 and df = 4 for lactate 20 mm vs control; unpaired t test) (Fig. 3B). In addition, lactate also induced the expression of synaptic plasticity genes, such as Arc and Zif268/Egr1 (for Arc, p = 0.0014 and df = 5 for lactate 20 mm vs control and for Zif268, p = 0.0039 and df = 6 for lactate 20 mm vs control) (Fig. 3B). We also confirmed that lactate increases the protein levels of BDNF (p = 0.0199, df = 4 for lactate 20 mm vs control) (Fig. 3D,F), ZIF268 (p < 0.0001, df = 2 for lactate 20 mm vs control) (Fig. 3D,G), and ARC (p = 0.0483, df = 4 for lactate 20 mm vs control) (Fig. 3E,H). These results suggest that lactate can specifically induce the expression of synaptic plasticity genes in neuronal cells. For this reason, we decided to test whether the lactate-mediated induction of synaptic plasticity genes and particularly BDNF/TRKB signaling correlates with learning and memory phenotypes. To test whether the lactate-mediated induction of Bdnf expression is responsible for enhancing learning and spatial memory formation, we performed MWM experiments. The MWM is a spatial learning task that requires mice to locate a hidden platform in an opaque pool of water using visual cues. Acquisition of spatial learning in both control mice and lactate-injected mice was observed as reduced latency to reach the hidden platform by day 5. Mice receiving lactate (117 and 180 mg/kg) significantly outperformed the control mice (Fig. 4A). To assess reference memory, we performed a probe trial 24 h after the last training session (day 6), during which the platform was removed. As expected, lactate-injected mice showed significant enhancement of memory recall, as indicated by increased time spent in the target quadrant (Fig. 4B). In this test, we only observed significant enhancement with the 180 mg/kg lactate dose. Both control and lactate-injected mice had similar swim speed during training days 1–5 (Fig. 4C). These results show that lactate did not affect mouse motility or swimming ability. To assess whether the lactate-mediated activation of the BDNF/TRKB pathway is responsible for enhanced memory formation, we injected mice with lactate (180 mg/kg) in combination with a TRK inhibitor, CEP701 (Obeid et al., 2014). Mice receiving this combinatorial treatment did not show a significant enhancement of memory recall (Fig. 4D). Together, our results are consistent with the model that exercise induces an increase in lactate concentration in the blood and hippocampus, which in turn mediates the induction of synaptic plasticity genes, such as Bdnf, leading to enhanced spatial learning and memory retention. To verify whether indeed exercise-induced learning is lactate-dependent, we injected exercising mice with the lactate transporter inhibitor AR-C155858 and tested their ability to navigate the MWM. These mice exhibited significantly worsened learning curves compared with exercise mice injected with saline (Fig. 4E). We were next interested in elucidating the mechanism of action of lactate and specifically how lactate can mediate Bdnf induction in the hippocampus. Peripheral delivery of lactate promotes learning and memory. A, Animals were trained for 5 d in a spatial version of the MWM. Animals receiving intraperitoneal injections of lactate (118 and 180 mg/kg) showed significantly reduced escape latency or the time (seconds) required to escape. Results are expressed as mean ± SEM. *p < 0.05 (two-way ANOVA followed by the Bonferroni post-test). B, Animals receiving intraperitoneal injections of lactate (180 mg/kg) spent significantly more time in the target quadrant during a 60 s probe test performed 1 d after the last training session. Results are expressed as mean ± SEM. Statistical significance between the target and the other three quadrants: ***p < 0.0001 (one-way ANOVA followed by Dunnett's post-test). Statistical significance between the target quadrants in saline and lactate-receiving mice: unpaired t test (p = 0.0056 and df = 65). C, The swimming speeds (meter/seconds) of the animals receiving intraperitoneal injections lactate were similar to those receiving saline, indicating that the effects observed in the training and probe test phase were not due to differences in motor behavior between the two groups of animals. D, Animals receiving intraperitoneal injections of lactate (180 mg/kg) in combination with the TRK inhibitor, CEP 701 (3 mg/kg), did not spend significantly more time in the target quadrant compared with animals receiving intraperitoneal injections of saline during a 60 s probe test performed 1 d after the last training session. Results are expressed as mean ± SEM. The number of animals used in each group is 5. Statistical significance was measured by the unpaired t test (p = 0.3117, df = 8). As expected, animals receiving saline spend significantly more time in the target quadrant. Statistical significance was measured by one-way ANOVA followed by the Dunnett's post-test; p = 0.0002 for target versus Quadrant 2 (Q2) and 3 (Q3) and p = 0.0014 for target versus Quadrant 4 (Q4). In contrast, animals receiving lactate and TRK inhibitor CEP701 did not spend significantly more time in the target quadrant compared with Q3 and Q4. One-way ANOVA followed by the Dunnett's post-test; p = 0.0295 for target versus Q2, p = 0.0652 for target versus Q3, and p = 0.4912 for target versus Q4. E, Inhibition of the lactate MCT transporters abolishes exercise-mediated spatial learning in the MWM paradigm. Exercise animals receiving intraperitoneal injections of the lactate MCT transporter inhibitor, AR-C155858 (50 nm/mouse) showed significantly increased escape latency or the time (seconds) required to escape compared with exercise animals receiving intraperitoneal injections of saline. Results are expressed as mean ± SEM. *p < 0.05 (two-way ANOVA followed by the Bonferroni post-test). **p < 0.01. Exercise is accompanied by increases in energy requirements and changes in the levels of high energy molecules, such as ATP and the reduced coenzyme NADH. One class of enzymes whose activity is dependent on NAD+ levels is the Sirtuins or Class III HDACs. This class of HDACs includes seven members (SIRT1–7) and is not only involved in the deacetylation of histones, but also many cellular proteins, including transcription factors. Among the members of this family, only SIRT1, SIRT6, and SIRT7 are resident nuclear proteins. Interestingly, voluntary exercise significantly induced the hippocampal expression of only Sirt1 at both the mRNA (p = 0.026 and df = 6; unpaired t test) (Fig. 5A) and protein levels (p = 0.0456 and df = 6; unpaired t test). (Fig. 5B,C). Even though exercise induced Sirt7 mRNA as measured by real-time RT-PCR, it did not significantly induce SIRT7 protein levels (data not shown). Because lactate is produced and removed in reactions that directly affect the NAD+/NADH ratio, we decided to evaluate whether lactate also affected SIRT1 levels. We injected mice intraperitoneally with saline or lactate and examined the protein levels of SIRT1 in the hippocampus. We found that systemic delivery of lactate significantly increased the hippocampal levels of SIRT1 (p = 0.0077 and df = 9; unpaired t test) (Fig. 5D,E). Interestingly, like exercise, lactate also induced Sirt7 mRNA as measured by real-time RT-PCR, but did not significantly induce SIRT7 protein levels (data not shown). We next tested whether exercise and lactate affected SIRT1 deacetylase activity. We found that both exercise (p = 0.05 and df = 3) and intraperitoneal injections of lactate (p = 0.059 and df = 3) increased SIRT1 activity in hippocampal nuclear proteins (Fig. 5F). 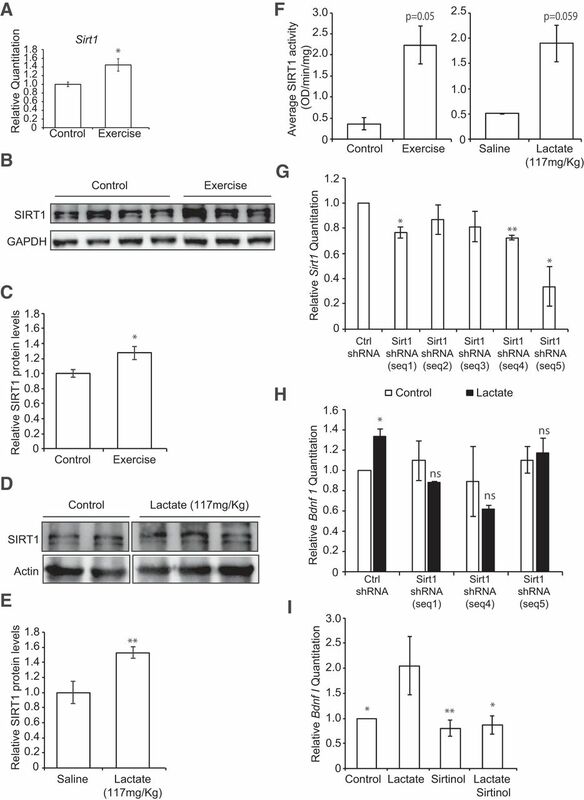 To evaluate whether the lactate-mediated induction of Bdnf expression is SIRT1 dependent, we used shRNAs to knockdown Sirt1 expression as well as a SIRT1 inhibitor, sirtinol, and tested whether decreased SIRT1 levels and activity abolished the lactate-mediated Bdnf induction in primary neurons. Indeed, while lactate increased Bdnf promoter I mRNA expression in cells expressing the scrambled shRNA (Ctrl shRNA), it failed to increase Bdnf promoter I mRNA expression in cells expressing the Sirt1 shRNA (Fig. 5G,H). In addition, the lactate-induced Bdnf promoter I mRNA expression was lost upon cotreatment of neurons with lactate and sirtinol (p = 0.0273 for control vs lactate, p = 0.0087 for sirtinol vs lactate and p = 0.0130 for lactate+sirtinol vs lactate; one-way ANOVA followed by the Dunnett's post-test) (Fig. 5I). These results suggest that lactate activates Bdnf expression through an SIRT1-dependent mechanism. Lactate induces Bdnf expression in an SIRT1-dependent manner. A, Voluntary exercise for 4 weeks significantly induced Sirt1 expression in the hippocampus as measured by real-time RT-PCR. The number of animals used for each group (control and exercise) is 3 and 5, respectively. *p < 0.05 (unpaired t test; p = 0.026 and df = 6). B, Representative Western blot image depicting the increase in SIRT1 protein levels in the hippocampus of control animals compared with exercising mice. C, Quantification of the SIRT1 Western blot. For control and exercise, n = 4. *p < 0.05 (unpaired t test; p = 0.0456 and df = 6). D, Representative Western blot image depicting the increase in SIRT1 protein levels in the hippocampus of mice receiving 117 mg/kg of lactate compared with mice receiving saline. E, Quantification of the SIRT1 Western blot. n = 5 saline injections; n = 6 lactate injections. **p < 0.005 (unpaired t test; p = 0.0077 and df = 9). 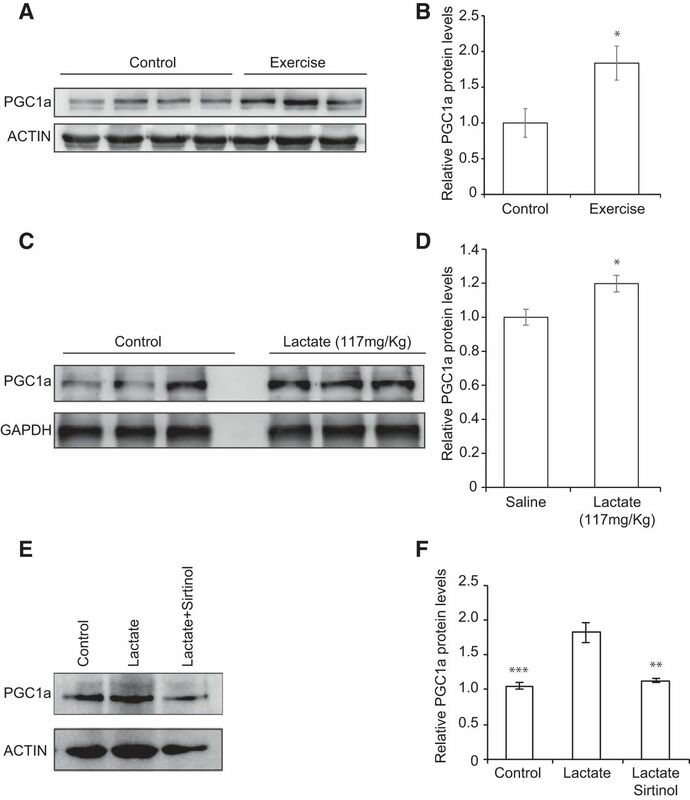 F, Exercise and lactate (117 mg/kg) induce SIRT1 activity in hippocampal nuclear extracts. *p < 0.05 (unpaired t test; exercise, p = 0.05 and df = 3; lactate, p = 0.059 and df = 3). G, Three shRNA sequences significantly decrease Sirt1 mRNA expression as measured by real-time RT-PCR. *p < 0.05 (unpaired t test; seq 1, p = 0.0351 and df = 2; seq 4, p = 0.0045 and df = 2; seq 5, p = 0.05 and df = 2). 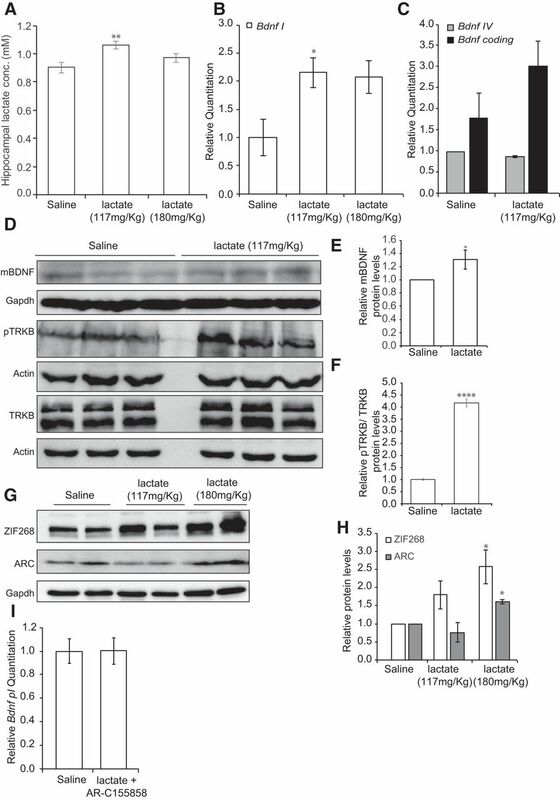 H, SirtI knockdown abolishes the lactate-mediated increase in Bdnf pI expression. *p < 0.05 (unpaired t test; p = 0.0497 and df = 2 for Ctrl shRNA vs Ctrl shRNA + lactate 20 mm). I, Sirtinol, a SIRT1 inhibitor, reversed the lactate-mediated induction of Bdnf pI expression in primary neurons as measured by real-time RT-PCR. For controls, lactate (20 mm), sirtinol (50 μm), and lactate + sirtinol treatments, n = 6, n = 4, n = 6, and n = 6, respectively. Each replicate consisted of primary neurons obtained from different cultures and treated with fresh dilutions of the compounds for 4 h. One-way ANOVA followed by the Dunnett's post-test: *p < 0.05; **p < 0.01 (p = 0.0273 for control vs lactate, p = 0.0087 for sirtinol vs lactate, and p = 0.0130 for lactate + sirtinol vs lactate). It was previously reported that voluntary exercise induces the expression of the transcriptional coactivator Pgc1a and Erra mRNA in the hippocampus. PGC1a and ERRa, in turn, coordinate to activate the hippocampal expression of the myokine Fndc5, which can induce Bdnf expression in the hippocampus (Wrann et al., 2013; Wrann, 2015). However, the mechanism by which the hippocampal induction of this pathway occurs in response to exercise has not been deciphered. We suspected that lactate could serve as the missing exercise factor. Indeed, one possible explanation for the effects of exercise is that it induces lactate accumulation in the hippocampus, which in turn activates SIRTs. SIRTs induce the PGC1a/FNDC5 pathway and lead to the induction of hippocampal Bdnf expression and enhanced learning and memory. To address this hypothesis, we first sought to confirm and assess whether voluntary exercise and intraperitoneal injections of lactate induce hippocampal PGC1a protein levels. 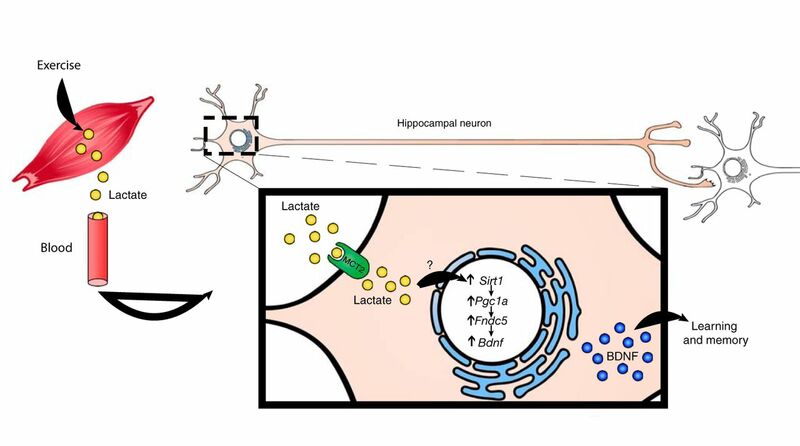 Indeed, Western blot analysis reveals that both voluntary exercise (p = 0.05, df = 4; unpaired t test) and intraperitoneal injections of lactate (p = 0.0436 and df = 4; unpaired t test) significantly increase hippocampal PGC1a protein levels (Fig. 6A–D). To determine whether the lactate-mediated induction of Bdnf represents an SIRT1-dependent engagement of the hippocampal PGC1a/FNDC5 pathway, we treated primary neurons with lactate alone or combined with the sirtinol and assessed PGC1a protein levels. Western blot analysis reveals that lactate induced PGC1a protein levels, and this induction is lost upon combinatorial treatment of lactate and sirtinol (p = 0.0007 for control vs lactate, p = 0.002 for lactate+sirtinol versus lactate; one-way ANOVA followed by Dunnett's post-test). (Fig. 6E,F). These results suggest that both lactate-mediated induction of PGC1a protein and BDNF expression are SIRT-dependent. Finally, it is well established that exercise-induced PGC1a mediates hippocampal expression of FNDC5, which in turn activates Bdnf expression (Wrann et al., 2013; Wrann, 2015). We observed that, like exercise (mRNA: p = 0.0183 and df = 5; protein: p = 0.0347 and df = 4; unpaired test) (Fig. 7A,C,D), intraperitoneal injections of lactate induce hippocampal Fndc5 mRNA expression as measured by real-time RT-PCR (p = 0.0152 and df = 8; unpaired t test) (Fig. 7B), and protein levels (p = 0.0112 and df = 4; unpaired t test) (Fig. 7E,F). Indeed, we found that, although lactate increased Fndc5 mRNA expression in cells expressing the scrambled shRNA (Ctrl shRNA), it failed to increase Bdnf promoter I mRNA expression in cells expressing the Sirt1 ShRNA (Fig. 7G). Together, these results are consistent with the model that exercise can promote learning and memory by inducing hippocampal Bdnf expression through lactate-mediated activation of the SIRT1/PGC1a/FNDC5 pathway (Fig. 8). SIRT1 modulates Bdnf expression through induction of PGC1a protein levels. A, Representative Western blot image depicting the increase in PGC1a protein levels in the hippocampus of control animals compared with exercising mice. B, Quantification of the PGC1a Western blot. *p < 0.05 (unpaired t test; p = 0.05, df = 4). C, Representative Western blot image depicting the increase in PGC1a protein levels in the hippocampus of mice receiving 117 mg/kg of lactate compared with mice receiving saline. D, Quantification of the PGC1a Western blot. *p < 0.05 (unpaired t test; p = 0.0436 and df = 4). E, Representative Western blot image depicting the increase in PGC1a protein levels in primary neurons treated with lactate (20 mm) and the reversal of this increase upon Sirt inhibitor (sirtinol 50 μm) cotreatment. These results suggest that the lactate-mediated induction of PGC1a protein levels is SIRT1-dependent. F, Quantification of the PGC1a Western blot. *p < 0.05 (one-way ANOVA followed by the Dunnett's post-test; p = 0.0007 for control vs lactate, p = 0.002 for lactate + sirtinol versus lactate). **p < 0.01; ***p < 0.001. 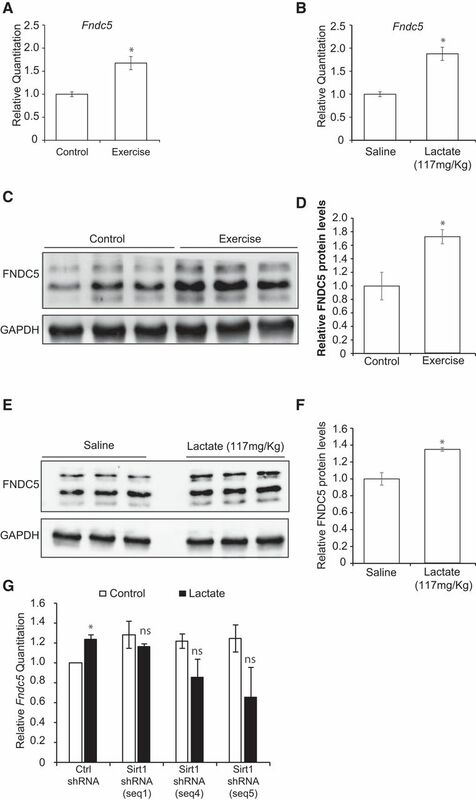 Lactate induces Fndc5 levels, a PGC1a-dependent Bdnf inducer. A, Voluntary exercise for 4 weeks significantly induces Fndc5 expression in the hippocampus as measured by real-time RT-PCR. The number of animals used for each group (control and exercise) is 3 and 4, respectively. *p < 0.05 (unpaired t test; p = 0.0183 and df = 5). B, Intraperitoneal injections of lactate (117 mg/kg) significantly induced hippocampal Fndc5 gene expression levels as measured by real-time RT-PCR. The number of animals used for each group is 5. *p < 0.05 (unpaired t test; p = 0.0152 and df = 8). C, Representative Western blot image depicting the increase in FNDC5 protein levels in the hippocampus of control animals compared with exercising mice. D, Quantification of the FNDC5 Western blot. *p < 0.05 (unpaired t test; p = 0.0347 and df = 4). E, Representative Western blot image depicting the increase in FNDC5 protein levels in the hippocampus of mice receiving 117 mg/kg of lactate compared with mice receiving saline. F, Quantification of the FNDC5 Western blot. *p < 0.05 (unpaired t test; p = 0.0112 and df = 4). G, SirtI knockdown abolishes the lactate-mediated increase in Fndc5 mRNA expression. *p < 0.05 (unpaired t test; p = 0.0318 and df = 2 for Ctrl shRNA vs Ctrl shRNA + lactate 20 mm). A proposed model by which exercise induces Bdnf expression in the hippocampus. Exercise induces lactate synthesis in the muscle. Lactate is transported through the circulation to the brain. In the hippocampus, lactate induces Bdnf expression through SIRT1-dependent induction of PGC1a. PGC1a, in turn, coordinates the increase in Fndc5 expression, which is known to induce Bdnf expression. This induction mediates exercise's positive effects on memory, cognition, and synaptic transmission. These results provide a link between running exercise, lactate, SIRT1, and Bdnf gene expression. Previous work showed that lactate that is supplied to neurons by astrocytes can promote LTP (Skriver et al., 2014) and is important for memory formation (Newman et al., 2011; Suzuki et al., 2011; Steinman et al., 2016). Indeed, lactate activates the expression of synaptic plasticity genes by activating NMDA and ERK signaling cascades (Yang et al., 2014). In addition, lactate reduces glutamate-induced toxicity in the cortex (Ros et al., 2001) and protects against ischemic insults both in vitro (Berthet et al., 2012) and in middle cerebral artery occlusion stroke models (Berthet et al., 2009, 2012; Castillo et al., 2015). The neuroprotective effect of intravenous administration of lactate against ischemic damage suggests that lactate may serve as a potential inexpensive therapeutic strategy for stroke (Berthet et al., 2009, 2012). It is highly conceivable that lactate might act to increase the levels of BDNF, which can promote learning and memory (Mu et al., 1999; Cirulli et al., 2004) as well as neuroprotection (Beck et al., 1994; Zuccato and Cattaneo, 2009; Zhao et al., 2017). It has long been established that physical exercise induces hippocampal Bdnf expression (Neeper et al., 1995; Oliff et al., 1998; Tong et al., 2001; Cotman and Berchtold, 2002; Adlard and Cotman, 2004; Adlard et al., 2004, 2005a; Berchtold et al., 2005) and that this induction is necessary for cognitive processes, such as learning and memory (Vaynman et al., 2004; García-Mesa et al., 2014; Kim and Leem, 2016). We have only recently started deciphering the molecular pathways linking the exercise-induced metabolic changes in the liver and muscle to hippocampal Bdnf expression and increased cognition. It is clear, though, that the link involves multiple endogenous “exercise factors” that are released in the blood, can cross the BBB, and accumulate in the hippocampus where they engage signaling pathways that activate Bdnf expression. One previously identified exercise factor is DBHB, a ketone body produced by the liver during exercise that accumulates in the hippocampus and induces Bdnf expression through HDAC inhibition (Sleiman et al., 2016). In this work, we identified lactate as a novel endogenous metabolite that links exercise to hippocampal Bdnf expression and to cognition. Lactate is not only supplied to neurons by astrocytes but is also released into the blood by the muscle during exercise. Lactate crosses BBB through MCTs and reaches multiple brain regions, including the hippocampus. During exercise, circulating lactate levels can reach 30 mm, and hippocampal levels also significantly increase (Fig. 1) (Ide et al., 1999, 2000). Interestingly, exercise increases Mct2 levels in the hippocampus, and this increase is correlated with increases in BDNF and TrkB signaling (Takimoto and Hamada, 2014). This observation is consistent with the measured increases in lactate (Fig. 2) that uses the Mct2 to reach the hippocampus where it can mediate Bdnf expression (Fig. 2) (Sleiman et al., 2016). Indeed, lactate levels increase in the hippocampus after exercise (Fig. 1) (Ide et al., 1999, 2000). Like exercise, systemic delivery of lactate through intraperitoneal injections induces hippocampal Bdnf expression and signaling and can mediate learning and memory formation (Figs. 1–4). Our results are consistent with the finding that lactate released from exercising muscles mediates cerebral angiogenesis through the activation of the lactate receptor HCAR1 (Morland et al., 2017). Interestingly, we found that lactate activates the NAD+-dependent histone deacetylase SIRT1 (Fig. 5), which in turn engage the previously identified hippocampal PGC1a/FNDC5 pathway to induce Bdnf expression (Figs. 6, 7). Exercise has been shown to increase Bdnf levels through the induction of hippocampal expression of Fndc5, a PGC1a and ERRa-dependent myokine (Wrann et al., 2013; Wrann, 2015). How exercise mediates the induction of PGC1a and ERRa in the hippocampus has not been clearly established. Like exercise, lactate modulates the redox status of neurons by altering the NAD+/NADH ratio (Koltai et al., 2010), which leads to the activation of SIRT1. We observed that the exercise-mediated induction of hippocampal PGC1a (Fig. 5); and in turn, FNDC5 (Fig. 6) expression is dependent on SIRT1 activity (Fig. 5). A common theme that emerges from our data are the convergence of the action of the identified exercise factors on protein acetylation. DBHB acts as a HDAC2/3 inhibitor and mediates Bdnf induction by promoting histone acetylation at its promoter, whereas lactate activates SIRT1 that deacetylates the transcriptional coactivator PGC1a. This promotes its activity (Gerhart-Hines et al., 2007; Cantó et al., 2009) and allows it to induce gene expression. This is not surprising considering that histone acetylation is a key regulator of memory consolidation in the hippocampus (Alarcón et al., 2004; Korzus et al., 2004; Levenson et al., 2004). Indeed, CREB binding protein (CBP) has been shown to be necessary for long-term memory formation (Guan et al., 2002; Korzus et al., 2004; Chen et al., 2010; Giralt et al., 2012). Introduction of a CBP activator that can cross the BBB promotes neurogenesis and increases memory duration (Chatterjee et al., 2013). In addition, CBP gene transfer rescues learning and memory deficits in an AD mouse model through the induction of BDNF (Caccamo et al., 2010). Moreover, pharmacological inhibition of HDACs promotes learning and memory formation (Levenson et al., 2004; Vecsey et al., 2007; Stefanko et al., 2009; Penney and Tsai, 2014). Indeed, how multiple HDAC isoforms affect learning and memory has been elucidated. For example, HDAC2, negatively regulates hippocampal-dependent memory (Guan et al., 2009; Yamakawa et al., 2017). Recently, it was found that the enzyme acetyl-CoA synthetase 2 (ACSS2) binds to promoters of neuronal activity and memory-related genes where it locally catalyzes the production of acetyl coenzyme A (Acetyl CoA) from acetate, coenzyme A (CoA), and ATP. The Acetyl group of acetyl CoA is transferred by HATs to the local histones, leading to unwinding of chromatin and activation of gene expression (Mews et al., 2017; Watson and Tsai, 2017). Because of the ability of exercise factors to modulate protein acetylation, it would be interesting to determine whether other metabolites, including acetyl CoA, which can affect protein acetylation, play important roles in the positive effects of exercise on learning and memory. In this paper, we provide evidence that an endogenous molecule, lactate, that crosses the BBB, is increased by exercise to enhance BDNF signaling in the hippocampus and in turn promote learning and memory (Fig. 8). These results support the hypothesis that the elusive factors that mediate the positive effects of exercise on the brain serve the dual purpose of an energy fuel and epigenetic modulators that mediate their effects by altering hippocampal gene expression. Continued identification of additional such factors is of relevance to people afflicted with neurodegenerative diseases or depression who are likely to benefit from the ability of exercise to stimulate BDNF. Interestingly, there is recent evidence the lactate can promote resilience to stress in chronic social defeat mouse models (N.K., R.E.-G., S.F.S., unpublished data) as well as serve as an antidepressant (Carrard et al., 2018). This work was supported by the Lebanese American University School of Arts and Sciences and Graduate Research Fund. The TRKb and p-TRKb antibodies are a kind gift from Dr. Moses V. Chao.